Are you looking for a great synthesizer? Then it is quite a must to read this Korg Minilogue review. In here, we will feature the reasons why this particular synth can be the next best choice for you. Read on! If you have been in the music industry for a long time already, you are probably familiar with the brand Korg. This particular name is a luminary when it comes to musical instruments. Specifically, they are specializing on crafting quality analog synthesizers. Moreover, they are quite known to produce excellent products at a very low price. Good examples of such are the Volca and Monotron Series. Their reinvented classic products like the ARP Odyssey and MS-20 also exhibits astute performance and affordability at the same time. 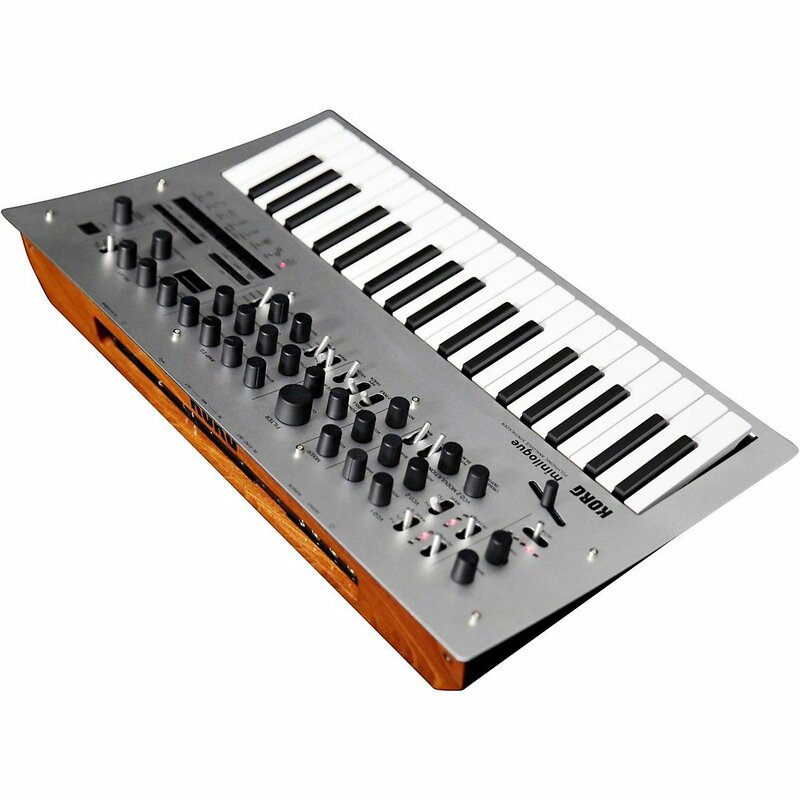 However, the biggest arsenal that the Korg created so far is perhaps the Minilogue. Specifically, this device is a keyboard poly synthesizer that possesses four independent voices. We all know how expensive synths are. 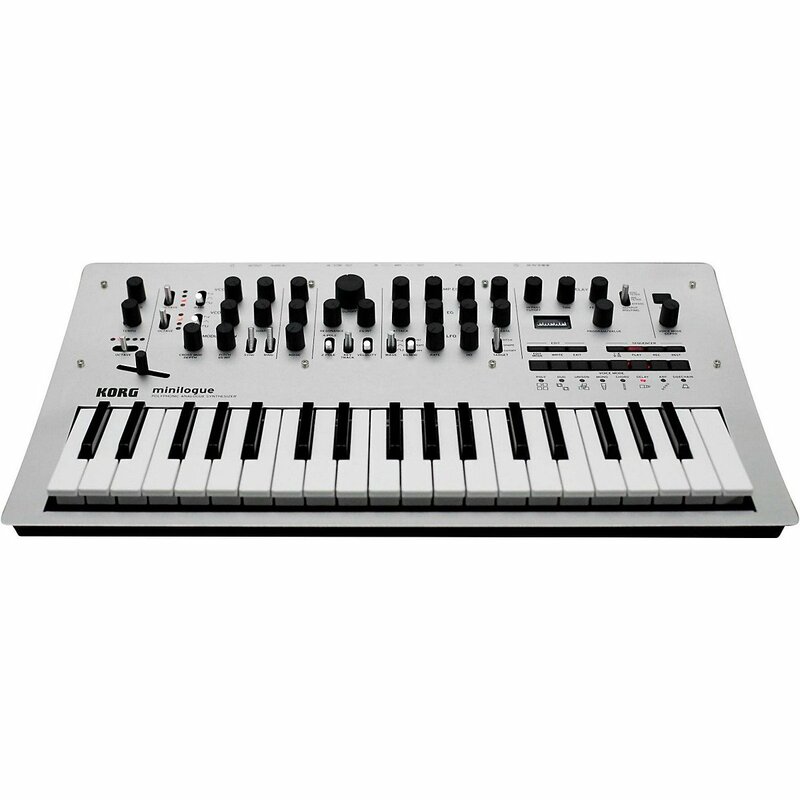 But you will be surprised that the Minilogue has a massive reduction in its price. That's not something you can see on a daily basis. Minilogue is a unique product of Korg. Unlike their previous synths, the circuitry of the Minilogue has an original concept. As a result, this product offers features that we have never heard from Korg. Of course, we should emphasize the stage and desktop applications were among the priorities of Korg when they created the Minilogue. In this article, we will showcase the different features of Korg Minilogue. Is this product worth buying? Or is it an option that you can simply ignore? All of the answers to these curious questions are here! So what are you waiting for? Read on! The Korg Minilogue has an outstanding design and interface. As we mentioned earlier, this device comes with four independent voices. Each of them possesses oscillators. Meanwhile, the oscillators can provide excellent triangle, sawtooth, and square waveform patterns. Of course, they wouldn't be complete with the noise source. You can control these oscillators through the use of its unique phase switch control. On the other hand, it also comes with a "Shape Control” that allows you to configure the waveforms. Stylish is the term that we will connote to the Minilogue. Its ambiance is pretty irresistible already. The controls and settings are highly innovative and fully programmable, too! We know that many artists are longing for authentic analog sounds. If that is on your mind, then this polyphony synthesizer will serve you best! The aesthetics and build of the Minilogue are pretty convincing. Its front panel is coated with anodized silver aluminum. The furnish itself enhances the durability of this device. Moreover, it has an intuitive contour design as well, which adds to its usability. Meanwhile, the chassis is from the combination of specialized plastic. It is complemented by the back panel made from Pyinkado wood. If you don't know, this particular South Asian hardwood is very durable. Therefore, this product can withstand multiple usages for many years! On the panel, you can see the twenty-nine plastic dials and fourteen metal switches. Each of these controls receives and sends MIDI signal, as well. They have metal shafts, too, which contributes to their overall durability. When we reviewed this product, we noticed that it has a better premium "feel" compared to other more expensive synthesizers. In that aspect, the Korg Minilogue has the upper hands. Overall, we can say that the Korg Minilogue is truly ergonomic. Well, it might not be the case if you are new to synthesizers. But if you are already familiar with these instruments, you will realize how user-friendly this synth is! If you compared it to other synths, Minilogue simply stands out! 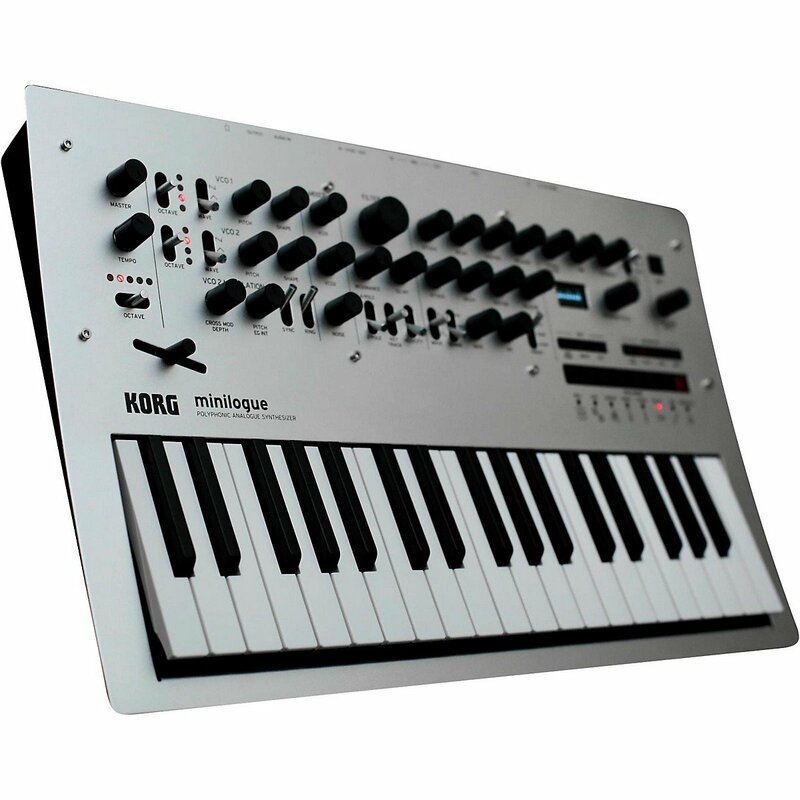 Here is the full specification of Korg Minilogue Analog Synthesizer. Read this thoroughly so that you won't miss any important facts about this product! The circuits of Minilogue are among the newest in the industry. When we tested this synth, we indeed experienced a sound like no other. Among its class, we can say that the Korg Minilogue is the unprecedented one. Of course, it is among the few synths that are using a four-voice analog system. Meanwhile, taking advantage of this feature is not difficult, thanks to its convenient interface. It doesn't matter if you perform in studios or live, this particular synthesizer will allow you to produce an authentic analog synthesis. Specifically, the structure of the synthesizer is composed of the following: 1VCF, 1 VCA, 1LFO 2VCO, and 2EG. This kind of setup allows the Minilogue to manipulate the harmonics of the oscillators finely. As a result, you can be able to create out-of-this-world compositions and sounds. The Minilogue is also using various kinds of modulations. Such of these are the oscillator sync, ring modulator, and cross modulator. The Hi-pass filter and Delay are also present in this synthesizers. Therefore, you can create any of those sounds that are iconic to an analog synth. Despite being an analog synthesizer, it is undeniable that Korg Minilogue goes beyond that. Among all the contenders on the same price range, it is only the Korg Minilogue that comes with 200 preset locations. Selecting any of these presets will give you access to unique sounds. From sharp leads up to tingling atmospheric effects, this device has them all! Moreover, there is no need for you to become a genius of synthesis so that you can take advantage all of these features. As we stated, all you have to do is to pick a preset, and you are ready to go! You can even tweak it the way you want it. Of course, we all know that musicians excel at that. When we tested this product, we found out that it got 200 programs. Excluded on that is a set of 100 default factory settings which are all editable. It also got 100 unique locations that will serve as your canvas for your next creation. It is also good to note that all of the preset comes with a delay and step sequence settings. This synthesizer is handy! The voice modes of Korg Minilogue are the ones that can manipulate the four-voice setup. Specifically, you can freely configure the voice so that the polyphony can have a blend of leads and basses. Or you can simply mix it into a parade of chords. Other options will even give you sudden shifts from octave to bass. In short, the possibilities are virtually limitless! Another great feature of the Korg Minilogue is its modulation and pitch bend control. You can find this control just above the keyboard's lower notes. The main function of this one is to complement with the instrument's various parameters. Such of these are the filter, gate length, and envelope settings. Meanwhile, the Ring Modulation, Cross Modulation, and Ring Modulation features of Minilogue will allow you to savor bright harmonics and metallic sounds. If you combine these tones with the Key Tracking and Velocity sensitivity functions, you will be able to create sophisticated timbres, too. The 16-step sequencer of the Korg Minilogue will allow any musician to be intuitive and creative. This feature comes with various recording capabilities that will fully harness the sound your produce. We noticed that the Minilogue is good with providing quick recordings and overdubbing. It also got a Step Recording feature that enables you to record by just specifying the notes that you want to include. Such capability is necessary for creating performances and phrases. So far, we find the Korg Minilogue to be an adequate analog synthesizer. But somehow, we noticed some missing components that synthesizers must have. Such of these are the pedal and the "Sample-and-Hold" inputs. Overall, this device is not quirky. But you might find the operation of the Velocity, Sync, Ring, and Key Tracking to be quite peculiar. Specifically, their positions are not as intuitive. But it is not the exactly a deal breaker that will give your money a run. Another thing that we have to note is that the factory presets of Korg Minilogue tend to be noisy. It somehow imbibes a party feeling. We know that some of you don't like that kind of setup. Fortunately, Minilogue is quite programmable. Therefore, you can make those traditional analog synthesizer sounds such as rich bass, flutes, and percussions. In the end, we can say that investing to Korg Minilogue is a wise thing to do. First, it is extremely affordable and gives you enough value for your money. Moreover, it provides a lot of features and programmable settings that will never limit your creativity. Also, we have to emphasize that this device is easy to use. Although it has some inadequacies, the Minilogue has still an overwhelming performance. It is perfect for both professionals and amateurs. Furthermore, it is has a durable construction, too. The hardware is not flimsy, and everything stays classy and stylish even years will pass! For us, the very reason why musicians love analog synths is due to the quality of their sound. Of course, we have to take into the account the level of control they give to us. If you integrate all these aspects together, the instrument will allow its user to be as expressive as he/she wants to be. And among the analog synths today, the Korg Minilogue proves to be the embodiment of such ideals. From accessibility to the availability of sound parameters, this instrument has them all. We recommend the Minilogue to anyone who wants to experience the sound of an authentic analog synthesizer. If you are among them, then you should grab your unit of this instrument now! Did you learn from this Korg Minilogue review? Tell us your thoughts in the comment section below! Also, do not forget to share this article to your social media accounts! Give your love to us!